For some reason, a 12th century Norman knight named Jocelin did not want his son to follow in his footsteps. We do not know why, but a common modern assumption is that Jocelin's son, Gilbert of Sempringham (c.1089-1190), had some physical deformity that would have made his career as a knight and warrior untenable. Whatever the case, Jocelin sent his son to study theology at the University of Paris. Gilbert came back to England in 1120 and, after being given the parishes of Sempringham and Tirington, joined the household of the Bishop of Lincoln, Robert Bloet (who started as a clerk in the household of William the Conqueror and later became Chancellor). He used his revenue from Tirington to aid the poor, and lived on the revenue from Sempringham. Robert Bloet's successor as Bishop of Lincoln ordained him a deacon, then as a priest after 1123, but when offered the archdeaconry of Lincoln he refused. In 1130 his father died. Gilbert inherited his father's Lincolnshire manor and lands, and returned there. He did not, however, abandon the religious life. He now had the income to execute some grander plans. He decided to found his own monastic order. The Gilbertines were originally composed of young men and women who had known and/or been taught by Gilbert in the parish school. It is the only monastic order founded in England. He used the Cistercians as his model, but when he appealed to the Cistercians themselves in later years for aid in maintaining and expanding the Gilbertines, he was rejected because of his inclusion of women. Things turned sour for Gilbert in 1165, when he was imprisoned by King Henry II on the suspicion that he aided the fugitive Thomas Becket. He was eventually exonerated. Trouble found Gilbert again about 1180 when the lay brothers among the Gilbertines rose up because they were worked too hard (to enable the religious brothers to spend their days in prayer). The case was taken to Rome, but Pope Alexander III supported the 90-year-old Gilbert. Still, it is reported that living conditions for lay brothers improved afterward. Gilbert, blind for the last few years of his life, resigned as head of the Gilbertines. He died in 1190 at the estimated age of 100+. His canonization did not take long: Pope Innocent III confirmed his sainthood in 1202, placing his Feast Day on 4 February, the day of his death, but it is now celebrated on 11 February. Being inquisitive is the first step to learning. * In the early Middle Ages, the presence of many classical authorities circulating in Latin, such as Aristotle and Plato, eliminated the need for inquiry in the opinions of many. The 12th century saw an influx of more works, many of them Greek writings (preserved by Arabs) or Arab writings. The widening of philosophical and scientific horizons by this wave of knowledge caused many scholars to re-think what had been established. 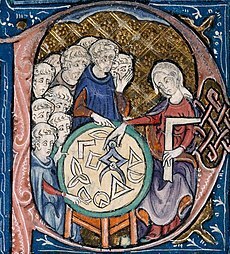 Adelard of Bath (c.1080-c.1152) was an English philosopher who was in a position to translate into Latin for the first time many of the Greek and Arabic works becoming available to the West. After studying at Tours and teaching at Laon in France, he traveled for seven years through Italy, Sicily, Syria and Palestine. He translated Al-Kwarizmi's astronomical tables and Euclid's Elements of Geometry from Arabic, wrote works on the abacus and on his love of philosophy, and a book called Questiones Naturales (Natural Questions) in which he tackled, in dialogue form, 76 questions about the world. One of his themes is the choice of using reason rather than merely accepting authority. To be clear: Adelard's science is not ideal: his periodic table of elements contains only four substances, which are mixed in various proportions to create all materials. Some animals see better by day or night because of either white or dark humor in their eyes. We see because an extremely light substance (Plato's "fiery force") is created in the brain, gets out of the brain through the two eyes, swiftly reaches an object and learns and retains its shape, then returns to the brain through our eyes so that we "see" what is in front of us. A mirror, whose surface is smooth, bounces back the fiery force, which on returning to us picks up our image on its way and allows us to see our reflection. Still, his works were copied and distributed, and influenced much of what was to come. His assertion of reason over blind acceptance of classical authorities was an important milestone in scientific thought. Many of his ideas are seen again in the writings of Robert Grosseteste, Roger Bacon, and Hugh of St. Victor. Once the printing press was perfected, Adelard's translation of Euclid became a standard text for a hundred years. *One of the followers of this blog is part of a group trying to promote inquiry-based learning in young people. Visit Prove Your World to learn more. When Holy Roman Emperor Henry IV took the Walk to Canossa and asked forgiveness of Pope Gregory VII in order to have his excommunication lifted, neither of them knew what they were starting. Back home, Henry was rejected by many of the powerful men of Germany because the pope refused to support Henry's return to the throne. They "elected" Duke Rudolph of Swabia; the pope confirmed him. Rudolph (c.1025-1080) had caused trouble for Henry before. Henry had become king at the age of 6, and Rudolph took advantage of the situation and used coercion to marry Matilda, Henry's sister, and be made Duke of Swabia. He was also given administrative authority over Saxony. As Henry's brother-in-law, one might think Rudolph would be supportive, but that same family connection and the resulting position as duke made him a suitable candidate for replacing Henry years later, even though Matilda had died in 1060 and Rudolph had remarried. The election took place in March 1077. On 25 May, the Archbishop of Mainz crowned Rudolph, who agreed to be subservient to the pope's wishes in the future. The citizens of Mainz were not supportive of this move, and in the ensuing revolt Rudolph had to flee to Saxony. Unfortunately, this cut him off from his forces and home in Swabia. Henry, still acting as king and still supported by many Germans, declared Swabia given to Frederick of Büren. Rudolph had difficulty getting the men of Saxony to leave their homes and fight for him. But in the next few years, he made minor progress against the forces of Henry. Also, the pope excommunicated Henry again, on 7 March 1080. Things seemed to be lining up for Rudolph, but the Battle on the Elster River in October was a turning point: Rudolph sustained wounds from which he could not recover, and died the next day. Henry then tackled the real opponent: Pope Gregory. He invaded Rome and forced Gregory out, replacing him with Pope Clement III. (Clement's appointment was, of course, irregular, and he is considered an antipope. He was pretty bad in his own right.) Rudolph's brief reign is considered that of an "anti king." When the Protestant Reformation came, Henry IV was touted as the "first Protestant" due to his opposition to papal authority. On the heels of the three "Church & State" posts, it is appropriate to talk about a clash between an emperor and a pope. Today is the 936th anniversary of the lifting of the excommunication of Holy Roman Emperor Henry IV. The roots of the conflict that led to the excommunication began in the Investiture Controversy, which can be summarized neatly: should the temporal authority of a king allow him to appoint spiritual leaders in his country, such as bishops and abbots? The practice was common, and the papacy wanted it stopped, declaring that the pope of course was the only authority who could approve spiritual appointments. In the 11th century, Pope Gregory VII (c.1015-1085) tried to assert the papacy's right to invest bishops, but Holy Roman Emperor Henry IV (1050-1106) continued exercising the traditional practice of the kings of Germany (and other countries). The debate turned ugly when Henry called a synod of German bishops and they denounced Gregory as pope. Gregory, in turn, called a synod in spring of 1076 and excommunicated Henry, giving him one year to repent and ask forgiveness or the excommunication would become permanent. A Christian country wanted a Christian king, and the excommunication prevented Henry from receiving the sacraments, including forgiveness for sins. This made his rule untenable, and pockets of violence against his rule broke out in Germany, ending in several German princes and prelates calling for his replacement unless the excommunication were lifted. The 26-year-old Henry saw the difficulty of his prideful position, and offered to meet with the pope at Augsburg, in Germany. The pope agreed, but on his northward travels he began to fear that he would be putting himself into the clutches of Henry's army. 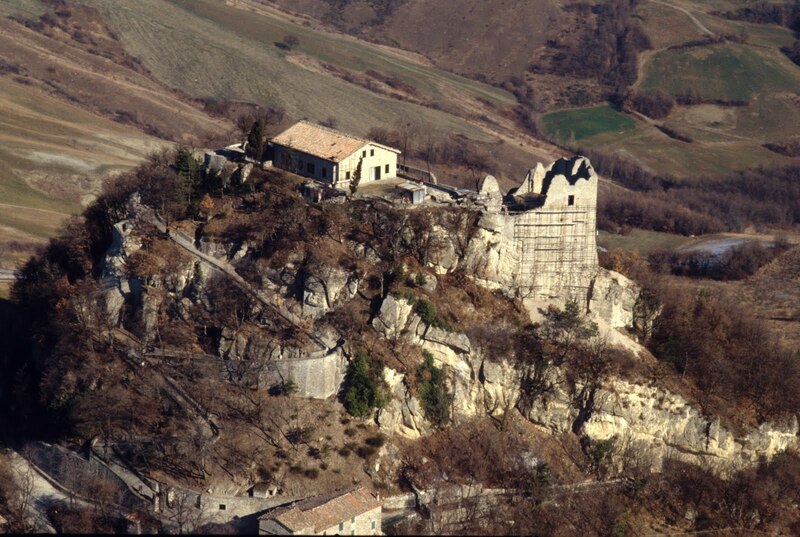 On the advice of Countess Matilda of Tuscany, he repaired to the fortress of Canossa, in northern Italy, to be able to defend himself. In order to meet with the pope, then, Henry and his army had to march a further 400 miles south of Augsburg, crossing the Alps in winter. The fear that Henry would try to conquer Italy grew. Gregory gave orders that Henry was not to be allowed into the fortress. When Henry reached Canossa in January 1077, however, he did something extraordinary. Letters written in later years by both Gregory and Henry confirm the story, if not al the details: the story says that he stood outside the gates for three days, in the snow, wearing only a hair shirt and refusing food. After three days, on 28 January, Gregory had the gates opened and Henry allowed in. Henry went onto his knees before the pope and begged his forgiveness. The excommunication was lifted. All was well. Henry was once again a Christian in good standing, but Gregory refused to endorse his return to the throne of the Holy Roman Empire. Two months after his stand at Canossa, a group of German aristocrats and archbishops and bishops declared his brother-in-law Duke Rudolph of Swabia. Years later, the Protestant Reformation would see Henry as a champion of the rights of Christians against an oppressive and wayward Roman Catholic Church, but right now, the troubles were just beginning. Part 1 showed how Christian writers eventually came to the conclusion that the State was not the result of Man's sinful nature, and had validity of its own. Part 2 talked about how the Church tried to assert its dominance in the Two Swords metaphor, especially with Pope Boniface VIII's Unam Sanctam. Immediately after Unam Sanctam, John of Paris wrote De potentate regia et papali (On royal and papal power). John was a Dominican who may have been a pupil of Thomas Aquinas. His work intended to defend the rights and standing of the French king. His argument was that autonomous political institutions existed before Christ established the Church. They were therefore created by human nature, which was created by God. There was no reason to suppose that political institutions such as nations (or their rulers) owed anything to the Church. Things got more heated in 1323 when Pope John XXII tried to interfere in the election of Louis IV of Bavaria, saying it was not valid until the pope confirmed it. Louis had himself crowned Holy Roman Emperor in Rome anyway. A quarrel ensued in which William of Ockham, currently under the protection of Louis for supposed heresies, took part. Ockham's approach was not just to give the State its due as ultimately an institution that is approved by God. His approach was that the monarch is granted his power by the collective consent of the governed. The pope, therefore, has no power to interfere in a nation's elections. Moreover, Ockham said that the pope may well be the Vicar of Christ on Earth, but that does not mean he should be allowed absolute authority. There should be a check on papal authority, a council that advises and can overrule him. Many of the established religious orders worked this way. Although popes may have opposed this idea, it took a council, the Council of Constance in 1414, to resolve the Great Schism started in 1378 when two men claimed to be the legitimate pope. Still, the relationship between Church and State will be debated forever, I am sure. Yesterday we looked at some of the history of political philosophy analyzing the proper relationship between the spiritual institution of the Church, headed by the papacy, and the temporal institution of the State, represented by nations (and, for later writers, by the Holy Roman Empire). We could see a progression from Augustine to Aquinas to Alighieri of the importance of the State as a natural and essential part of Man's existence, related to but separate from the Church. Aquinas believed that there was no inherent connection between the State and sin, and that the State, as a natural institution approved by God, would have existed even if the Fall in Eden had not taken place. Putting the State and the Church on equal footing supported the metaphor of the Two Swords. Pope Gelasius I (pope from 492 until his death in 496) had offered this metaphor, but he saw the State as the temporal support of the superior Church. The papacy preferred this view, which was further explicated by Giles of Rome (1246-1316) in his De ecclesiastica potestate (On ecclesiastical power). Giles repeats the metaphor of the Two Swords, and reinforces that the Church possesses the power of the State. The Church does not wield temporal authority directly, but should wield it indirectly, by telling the State what to do. This idea was drawn on by Pope Boniface VIII in his bull Unam Sanctam, in which he declared that everyone must be subordinate to the pope. Boniface thought he was establishing the last word on the subject, and that he would at least have the clergy on his side. Boniface was wrong. Augustine of Hippo (354-430) had very strong feelings about the difference between spiritual and temporal authority and structures. In his City of God he makes it clear that earthly governing structures, i.e. the State, were spiritual Babylons, equivalent to fallen and sinful institutions. The Church was the true and proper guide for mankind through this world. Had Adam and Even not sinned in Eden, mankind would have been able to live in harmony with itself and the world, and temporal structures would not be necessary. After all, the State seemed to exist in order to regulate behavior, particularly behavior that was detrimental to others. In an un-Fallen world, this would be unnecessary. Augustine was living in a Roman Empire that was Christian-friendly, but still remembered the persecutions. His attitude on the State was likely based on his knowledge of the persecutions and of historical pagan nations, and was therefore more harsh, seeing the State as the direct opposite of the Church. Thomas Aquinas (1225-1274, also mentioned here) took a slightly different view. He was surrounded by States with Christian rulers and was willing to consider the State without condemning it. Like Aristotle, Aquinas saw society as a natural institution for mankind, and therefore something ordained by God. The State was another form of society, and therefore was a part of man's natural inclination and therefore also was ordained by God. Church and State were both important institutions, but not separate in their goals. For Aquinas, the Church existed to help mankind attain its spiritual goal. It did not follow, however, that the State existed to help mankind attain a temporal goal. Mankind has only one goal: a spiritual one. Therefore, the State exists to support man's spiritual goals as well. Any conflict between the actions of the two should be resolved in favor of the Church, whose primary goal is spiritual. Dante Alighieri (1265-1321) and Aquinas were in agreement about one point: both Church and State were important, just in different ways, and neither should try to usurp the other's authority. Dante, however, observed first-hand the serious clashes between the papacy and empire, and tended to come down on the side of empire. If the State was a society ordained by God, then Dante saw the emperor as ruling by divine grace, and therefore no mortal should be considered to be superior to the emperor. Dante also held up the empire as the only instrument able to achieve peace. What did the papacy think of this line of reasoning? We will see that tomorrow. Saint Walburga (c.710-779), mentioned yesterday because of the "Oil of Saints" that flows from the stone and metal on which her relics rest, deserves a little more attention. Walburga taming the water, by Peter Paul Rubens. She was born in Devonshire in England. Her whole family was very devout: her father was St. Richard the Pilgrim, her uncle was St. Boniface (d.754), and her brothers Winibald and Willibald also became saints. She was raised by the nuns of Wimborne Abbey. Her education was very thorough. She is presumed to be the author of a life of St. Winibald and an account of the travels through Palestine of St. Willibald, making her the earliest known female author in Western Europe. While St. Boniface was christianizing Germany, he called for help from women as well as men. St. Walburga and many other nuns started a voyage to Germany. When a storm threatened to capsize the craft, Walburga knelt on the deck and prayed for deliverance, whereupon the waters immediately became calm. Upon landing, the sailors told everyone who would listen of the miracle, and Walburga's fame grew. Arriving at Mainz, she joined St. Boniface and St. Willibald, and later was made abbess of Heidenheim, putting her near Winibald who was abbot of the companion monastery of Hahnenkamm. When Winibald died in 751, she became the abbess of both monasteries. When she died in 779 (or 777, the records not being clear), Willibald placed her remains near their brother's; traffic to the tombs for cures and miracles was substantial. Willibald himself died in 786, after which Walburga's fame faded. In 870, Bishop Otkar of Eichstadt decided to restore the now-decrepit monastery of Heidenheim. In the process, the remains of Walburga were disturbed. She appeared to Otkar in a dream one night, reproaching him for the actions of the workmen. The bishop resolved to move her remains with great care to Eichstadt to the Church of the Holy Cross, which was renamed for St. Walburga. This is where her relics, placed in a stone and metal receptacle, began to produce the liquid that is reputed to have curative properties. The substance was first noted in 893 when Otkar's successor, Bishop Erchanbold, opened the tomb to share the relics with the abbess of Monheim. It still appears to this day, and only has not appeared when Eichstadt was under church Interdict, and an occasion when robbers shed the blood of a bell-ringer in the church. In 1905, C.M. Kaufman of Frankfort led an expedition into Egypt and made excavations that unearthed the legacy of St. Menas. He found the ruins of a monastery, a well, a basilica, many inscriptions asking the saint's aid, and thousands of miniature water pitchers and oil lamps. Based on the inscription on the vessels found by Kaufman (Eulogia tou agiou Mena = Remembrance of St. Menas), the vessels were intended as souvenirs of the saint. The location excavated was one of the most popular pilgrimage sites in the 5th and 6th centuries, and flasks like those found by Kaufman had been found for years in Africa, Spain, Italy, France and Russia. It was assumed that they contained oil, but now it is thought that they probably held water from the local well, and likely were supposed to have curative powers. 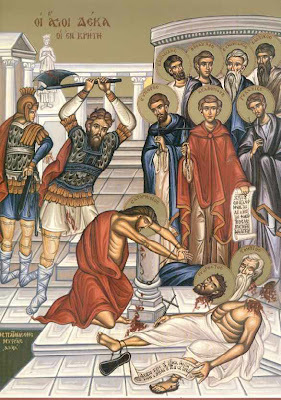 According to the Catholic Encyclopedia, Menas was martyred under Emperor Diocletian in 295 (other sources say 309—there was more than one Menas in the first few centuries of the Common Era, and it is difficult to reconcile all the records). 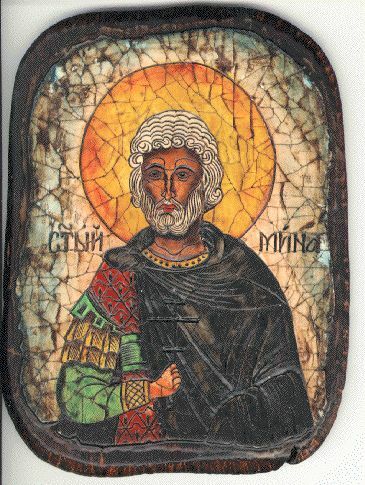 An Egyptian by birth, Menas had actually served in the Roman army, but left the army when he learned of the poor treatment of Christians by the empire. He went into retreat, engaging in fasting and prayer. He came out of retreat to proclaim the Christian faith in the middle of a Roman religious festival. He was dragged before the authorities, scourged and beheaded. Here is where the legend truly begins: supposedly, his body was to be burned, but the flames worked on it for three days without destroying it. The martyr's body was brought to Egypt and placed in a church, and his name began to be invoked by Christians in need. Then an angel appeared to Pope Athanasius, telling him to have the body transported into the western desert outside Alexandria. While being transported, the camel carrying it stopped at one point and would not move. The followers buried the body in that spot. Later, the location was forgotten, but a shepherd noticed that a sick sheep fell on a certain spot and rose up cured. The story spread that this spot cured illnesses. When the leprous daughter of the Emperor Zeno (c.425-491) traveled there for a cure, she received a vision at night from St. Menas, telling her that it was his burial place. Her father had the body exhumed, a cathedral built, and a proper tomb prepared for St. Menas. A city and industry sprang up, since so many people came to be cured. Water from the well dug in that location began to be bottled for pilgrims and supplicants. These flasks were found in several countries, but it wasn't until Kaufman's 1905 expedition that their true origin was uncovered. Electrical and Mechanical Engineers have their own patron saint—at least, in the British Army they do. Saint Eligius (or Eloi, or Eloy) was born about 588 near Limoges, France. His father recognized skill in him, and sent him as a young man to a noted goldsmith to learn a trade. He became so good at it that he was commissioned by Clothar II, King of the Franks, to make a golden throne decorated with precious stones. With the materials he was given, he made the throne with material left over ("enough for two" it was said). Since it was not unknown for artisans to use less than they were given and hide away the excess for their own wealth, Eligius' honesty in designing the throne was noteworthy. On the death of Clothar, his son Dagobert became King of the Franks. Dagobert (c.603 - 19 January 639) appointed Eligius his chief councilor. Dagobert is considered the last king of the Merovingian line to wield any real power on his own. After him came the weak kings that allowed the Mayors of the Palace to establish the Carolingian dynasty. Dagobert and Eligius became very close, and it is said that Dagobert relied in Eligius heavily—sometimes exclusively—for advice. With Dagobert's help (i.e., money) Eligius established several monasteries, purchased and freed slaves brought into Marseilles, sent servants to cut down the bodies of hanged criminals and give them decent burial. In 642, the goldsmith and councilor became a cleric when Eligius was made Bishop of Noyon. He undertook to convert the non-Christians in his diocese, and preached against simony in the church. Some of his writings have survived. But it was the legends after his death that gave him his current reputation. Of course he is the patron of goldsmiths and craftsmen, and is often depicted holding a bishop's crozier in one hand and a hammer in the other. By extension, he is the patron of all metalworkers, which would include blacksmiths. Over time, the skills of the blacksmith evolved into the skills of mechanical engineers. But that is not to say that Eligius was not a problem-solver on a par with engineers. The legend tells that he was once faced with a horse that refused to cooperate with being shod. Eligius cut off the leg that needed shoeing, put a horseshoe on the detached hoof, then re-attached the leg to the horse! The Corps of Royal Electrical and Mechanical Engineers of the British Army have taken Eligius for their patron saint. Almost 100 manuscripts exist that are part of the legend of Prester John, mostly copies of the letter supposedly written from him to one or more popes. The European Middle Ages was fascinated by the exotic tales of the Far East, and excited at the idea of a powerful Christian Priest-King responsible for promoting Christianity in areas not yet reached by western missionaries. So what was the world of Prester John like? He ruled over 72 countries, for one thing. In those lands could be found men who lived for 200 years, men with horns on their foreheads or three eyes, unicorns, and women warriors who fought on horseback. Several of the features of his world were apparently "borrowed" from the 3rd century Romance of Alexander, such as cannibals, elephants, headless men whose faces were on their torsos, pygmies, rivers that flowed out of Eden, and the fountain of youth. Exactly where these fabulous creatures and locations could be found was debatable. Marco Polo identified Prester John's kingdom with a Nestorian Christian tribe in Mongolia. India was often listed as his location, but India was a vague concept to most Europeans. A legend that Ethiopia was Christian led many to assume that Prester John ruled that land. The Portugese on their 15th century maritime excursions searched the coasts of Africa hoping to find access to his kingdom. 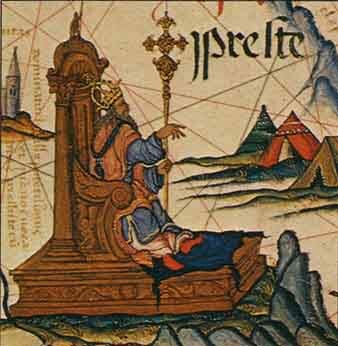 Once the globe had been circumnavigated in the 1600s and Africa and India were discovered to be lacking in any ruler named Prester John, the legend was given up. That "inaccessible area" in Asia mentioned in the Finding Paradise entry fascinated Europeans. Knowledge of the lands to the east was rare, and accounts of travels in that direction were devoured. Marco Polo's tales were only one example. The 3rd century apocryphal text Acts of Thomas tells of St. Thomas and his attempts to convert India to Christianity. Although not included in the definitive collection of books of the Bible, it was still copied and read (Gregory of Tours made a copy), and sparked the imagination: what if there were a thriving community of Christians in exotic India, cut off from Europe and desirous of contact? In the 12th century, a German chronicler and bishop called Otto of Friesling recorded that in 1144 he had met a bishop from Syria at the court of Pope Eugene III. Bishop Hugh's request for aid in fighting Saracens resulted in the Second Crusade. During the conversation, however, Bishop Hugh mentioned a Nestorian Christian (Nestorians and their origin were briefly mentioned here) who was a priest and a king, named Prester John, tried to help free Jerusalem from infidels, bringing help from further east. He had an emerald scepter, and was a descendant of one of the Three Magi who brought gifts at Jesus' birth. The idea of Prester John, a fabulously wealthy and well-connected Christian potentate poised to help bridge the gap between West and East, captured the imagination. A letter purporting to be from Prester John appeared in 1165. The internal details of the letter suggest that the author knew the Acts of Thomas as well as the 3rd century Romance of Alexander. The letter became enormously popular; almost a hundred copies still exist. It was copied and embellished and translated over and over. Modern analysis of the evolution of the letter and its vocabulary suggest an origin in Northern Italy, possibly by a Jewish author. At the time, however, no analysis was needed for people to act. Pope Alexander III decided to write a letter to Prester John and sent it on 27 September 1177 via his physician, Philip. Philip was not heard from again, but that did not deter the belief in Prester John at all. One of the decrees that came out of the Fourth Lateran Council of Pope Innocent III was that "every cathedral or other church of sufficient means" was to have a master or masters who could teach Latin and theology. These masters were to be paid from the church funds, and if the particular church could not support them, then money should come from elsewhere in the diocese to support the masters. The interest of the Roman Catholic Church in providing education has a long history. 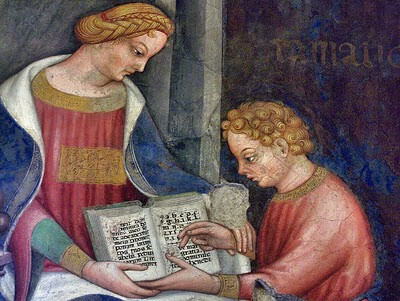 This did not start in 1215, actually: the Third Lateran Council of 1179 (called by Pope Alexander III) had already declared that it was the duty of the Church to provide free education "in order that the poor, who cannot be assisted by their parents' means, may not be deprived of the opportunity of reading and proficiency." One wonders how carefully churches complied with this. Because the school was integral to the church it was attached to, records are not as abundant as they might be if the school were a separate legal entity with its own building, property taxes, et cetera. We have to look for more anecdotal and incidental evidence. Schools for young boys stayed attached to churches for a long time. A late-medieval anecdote of Southwell Minster in Nottinghamshire (believed to be the alma mater of Thomas Cranmer, Archbishop of Canterbury under Henry VIII) tells that a visiting clerk (priest) complained that the noise of the boys being schooled was so great that it disturbed the services taking place. And Shakespeare's Twelfth Night acknowledges these schools with the line "Like a pedant that/Keeps a school i' the Church." It would be a long time before schools for the young were deemed to need their own buildings. 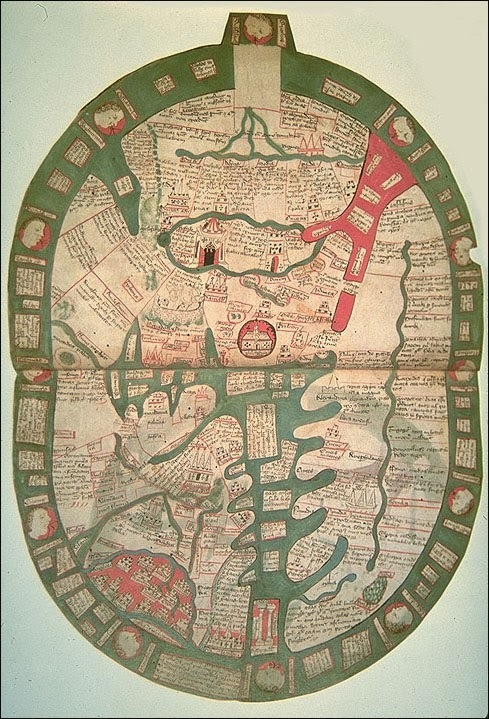 Medieval mapmakers, if they wanted to be thorough, of course had to account for the Garden of Eden. Surely it existed somewhere in the world, but where? It certainly wasn't in Europe, which was fairly well traveled, and so the medieval mind had to look beyond the lands they knew. 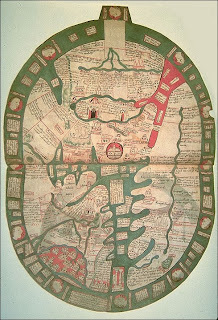 The 13th century Hereford map (a mappa mundi of the T-O pattern; see the link above) places Eden on an island near India, surrounded by not only water but also a massive wall. Ralph Higden places it not only in the less-understood-to-Europeans Asia, but makes clear it is an inaccessible part of Asia (you have to explain why no one has stumbled upon it and returned with the news). A German priest of the 15th century, Meffreth, seems to be the only person who thinks himself qualified to actually answer the question "Wouldn't Eden have been washed away in Noah's Flood?" He has left us a sermon in which he claims that Eden exists on an extremely tall mountain in Eastern Asia—so tall, that the waters that covered Mt. Ararat merely lapped at the base of Eden on this mountain. He further explains that four rivers pour from Eden at such a height that the roar they make when descending to the lake at the foot of the mountain has rendered the locals completely deaf. After the 15th century, we find few references to a terrestrial location of Paradise. As man started to circumnavigate the globe and explore the interiors of more continents, it became clear that finding Eden was not going to be a simple matter of traveling. "Grammar" comes from the Greek gramma, meaning "letter of the alphabet" or "thing written." Their word grammatike meant "the art of letters." The Romans pulled this word into Latin unaltered, and it eventually slid into Old French where it became gramaire, and thence to Modern English and the word whose study American schoolchildren try to avoid today. Grammar had its fans in the Classical and early Medieval eras, however, and none more zealous than Priscianus Caesariensis. We don't know too many details about Priscian, but we know he flourished around 500 CE, because that's about when his famous work on grammar appears. According to Cassiodorus (c.485-c.585), who was writing during the administration of Theodoric of the Ostrogoths, Priscian was born in Caesarea, in what is now Algeria. Cassiodorus himself lived for a while in Constantinople, and he tells us that Priscian taught Latin in Constantinople for a time. Priscian wrote a work called De nomine, pronomine et verbo (On noun, pronoun and verb), probably as an instructional tool for his Greek-speaking students. He also translated some Greek rhetorical exercises into Latin in Praeexercitamina (rhetorical exercises). 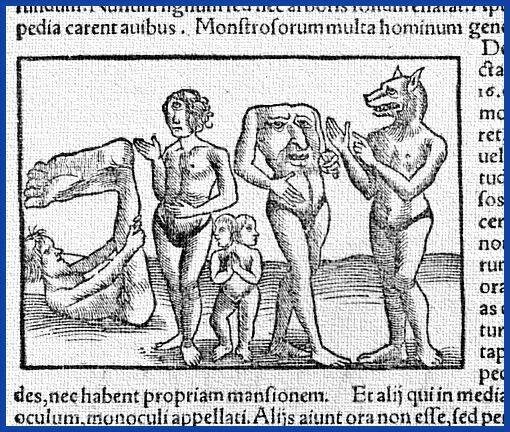 There were also some minor works that don't concern us, because we need to talk about his 18-volume masterpiece, Institutiones grammaticae (Foundations of grammar). He patterned it works of Greek grammar by Apollonius Dyscolus and the Latin grammar of Flavius Caper. His numerous examples from Latin literature mean we have fragments of literature that would otherwise have been lost to us. Priscian became popular: his work was quoted for the next few centuries, and copies became numerous enough—and his scholarship good enough—that this work became the standard grammar text for 1000 years after his time. We know a copy made it to England by 700; it was quoted by Bede and Aldhelm and copied by Hrabanus Maurus. 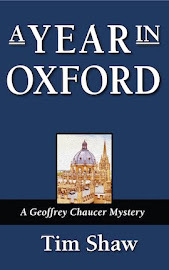 It was a standard text centuries later at Oxford and Cambridge. Manuscripts (there are about 1000 copies extant) exist from as early as the 9th century, and in 1470 it was still important enough that it was printed in Venice. Yesterday we looked at the use of the word "school" in the Middle Ages. Today, let's look at the descriptive term "grammar" when applied to schools. There is a document from the late 11th century that refers to a scola grammatice [grammatic/grammar school]. We see that and similar phrases becoming more common in the 1200s. In 1387 we get the first reference in English to a "gramer scole" by John of Trevisa (briefly mentioned here), who is translating Ralph Higden's Polychronicon* and uses the phrase to refer to a school in Alexandria. What was covered in "grammar" schools? Well, it was synonymous with what a later age called the study of "letters," and comprised learning from great writings. Grammar school was all about reading great literature from the past and committing the lessons found therein to heart. One learned how the great writers—who could on rare occasions be pagan writers, but were mostly the Church Fathers, as well as the Latin Bible—constructed their brilliant sentences and built their arguments. Of course, these great minds of the past did not write in English, and so the study of "grammar" could not truly be undertaken until one learned Latin. For young boys beginning instruction—usually at a nearby church under the tutelage of a priest—the first stage was learning Latin. Latin grammar had been dissected and discussed at great length by scholars in the past, particularly by two Latin writers named Priscian and Donat. But let's save them for tomorrow. *This work was an attempt to write a universal history, hence the name meaning "many times." When we think of the history of schools, we imagine an unbroken line of buildings and teachers and groups of pupils sitting on chairs or benches or stools, and our imagination stretches back through a more and more primitive setting. That is, we think of the medieval school as visually similar to the modern classroom, but with less technology, simpler furniture, etc. An understandable image, but not accurate. For instance, classes at Oxford 700 years ago would not be recognizable to us. The master would probably be visiting his pupils in a room rented by them, or at his house. Furniture would not be present—no one was going to own that many chairs or stools, or even benches. They would stand together and talk. We need to alter slightly our use of the word "school" for this context. Nowadays we use it to refer to the location or building. Just as "home is where the heart is," however, "school" was simply the gathering itself of a master and a pupil or pupils. The word school, from the Greek schola, ultimately relates back to "leisure." School (as the Greeks would say of arts in a civilization) is only possible when there is the time to cease toil and discuss higher aspirations. Early references to "school" (such as in Bede) make clear to us that it is not clear that a building is involved, just an intent to provide instruction. Now what about "grammar"? I attended grammar school, and still use the phrase, although there was very little grammar involved. Why do we call them that? We'l look at that in Part 2. King Oswy (also Oswiu or Oswig), who was a friend of Benedict Biscop, ruled Bernicia, a small section of Northumberland between what is now Edinburgh and Newcastle upon Tyne. According to Bede's writings, Oswy would have been born about 612. Unfortunately for him, his father, King Æthelfrith of Bernicia, was killed in battle against the King of the East Angles, and Oswy and his siblings and their supporters had to flee to exile. They were not able to return to power until 633. Oswy became king when he succeeded his brother Oswald, who died in battle in 642. In 655, a military victory temporarily made Oswy ruler over much of Britain. This position didn't last very long, but Oswy still remained significant in the larger affairs of Britain. He was especially interested in and supportive of the church. Oswy had been crucial to the foundation of Melrose Abbey. He had allowed his daughter to become a nun. His interest in relics was supported by Pope Vitalian sending him iron filings from the chains that had been used to imprison St. Peter. In 664, the Synod of Whitby was held to make choices about how Christianity would be practiced, and Oswy was asked to choose. He chose the version of Christianity that was being practiced by Rome over the Celtic version. This also meant calculating the date of Easter differently. This created some awkwardness; Oswy's son had been raised following Irish-Northumbrian practices but switched to Roman practices at the urging of St. Wilfrid (who was mentioned in a footnote here for his influence on Whitby). Oswy chose to side with his son and Rome, but not everyone found it so easy to switch. Bede reported for 665 "that Easter was kept twice in one year, so that when the King had ended Lent and was keeping Easter, the Queen and her attendants were still fasting and keeping Palm Sunday." The Archbishop of Canterbury, Theodore of Tarsus, traveled north to visit Oswy in 669 and made such an impression that Oswy was going to make a pilgrimage to Rome. He never made it, dying on 15 February 670. He was buried at Whitby, where his daughter the nun then resided. The cleric and writer called the Venerable Bede has cropped up many times here; his learning is known to us by his translation of parts of the Bible, his work on the Reckoning of Time, on sciences, and the respect held for him by others. Let's use him again as our lead in to another topic, with the question: "Where did he acquire his learning?" The answer is in the library at the monastery at Jarrow, built by Bede's tutor. Benedict was born into Northumbrian aristocracy about 628, and as an adult as a thegn loyal to King Oswy. About 653, Benedict agreed to travel to Rome with his friend, Wilfrid (later to be Saint Wilfrid the Elder). Although Wilfrid was detaind at Lyon, Benedict continued to Rome. Already a Christian, the trip to Rome and visits to sites connected to the Apostles made Benedict more fervent than ever about his faith. So when King Oswy's son Ealfrith wanted to go to Rome some years later, Benedict happily accompanied him. This time, he did not return to England, but stopped at Lerins Abbey on what is now the French Riviera, where he undertook to learn the life of a monk. After two years of this, he boarded a merchant ship that was heading to Rome. On his third trip there, in 668, he was given the job by Pope Vitalian to go to England and be an advisor to the Archbishop of Canterbury, Theodore of Tarsus. Returning to England, Benedict introduced the construction of stone churches with glass church windows. He also became a proponent of Roman styles of Christian ritual, rather than the Celtic style that had developed in England and Ireland. King Ecgfrith of Northumbria gave Benedict land for a monastery in 674; Benedict would found the Abbey of St. Peter in Wearmouth. He traveled to the continent to bring workers and glaziers to make a worthy monastery, and made a trip to Rome in 679 in order to bring back books. Other trips were made as well to provide books for the monastery. The monastery so pleased the king that Benedict was given more land for a second monastery in Jarrow, and this was to be called St. Paul. Not long after, Benedict himself was seized by a disease. [...] Benedict died of a palsy, which grew upon him for three whole years; so that when he was dead in all his lower extremities, his upper and vital members, spared to show his patience and virtue, were employed in the midst of his sufferings in giving thanks to the Author of his being, in praises to God, and exhortations to the brethren. Benedict Biscop (pronounced "bishop") died on 12 January, 690. The Second Council of Lyons, mentioned yesterday, accomplished many things. It was called by Pope Gregory X partially to attempt a reconciliation between the Eastern and Western Churches—Byzantine Emperor Michael VIII (1223-1282) had requested this. One of the items on the agenda was getting the two churches to agree to the same theology. The Filioque ["and the Son"] controversy was still an issue. The Greek text of the Nicene Creed was that the Holy Spirit proceeds "from the Father." The Roman view was that the Holy Spirit proceeds "from the Father and the Son." This divergence was firmly established in 325 by the first Nicene Council. The Greek delegation conceded to add the words "and the Son" to their version of the Creed. Sadly, Michael VIII's successor, Emperor Andronicus II (1259-1332), rejected the change. The other East/West connection established at the Council was relations between Europe and the Mongol Empire of Abaqa Khan. A Crusade was planned, and the representatives of the Khan (one of whom went through a public baptism at Lyons) agreed to not hassle Christians during the war with Islam. Abaqa's father had once agreed to exempt Christians from taxes. Unfortunately, the Crusade never happened, and the grand gesture of cooperation did not take place. So...improvements in East/West relations were attempted, but ultimately failed. The Council also was marred by other events. 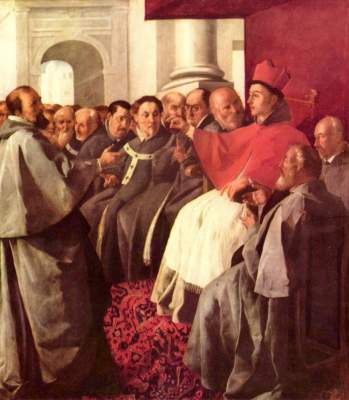 Thomas Aquinas wanted to attend, but died on the way. St. Bonaventure did attend, but died during the sessions..
Today is the anniversary of the death of Pope Gregory X. He has already been mentioned in Daily Medieval, but let's take a closer look at his career. His election as pope came after a three-year vacancy (1268-1271) in the position. The cardinals were split between French and Italian factions. Charles of Anjou, younger son of King Louis IX of France, had taken over Sicily and started to interfere with Italian politics. The French cardinals were fine with this; the Italian cardinals were not. The cardinals met in the town of Viterbo and vote after vote produced no clear candidate. Finally, the citizens of Viterbo locked them into the room where they met, removed the roof to expose them to the weather, and allowed them nothing but bread and water. On the third day, they picked a pope. Cardinal Teobaldo Visconti was Italian, but had lived most of his life in the extreme north and was unaffected by the recent Sicilian difficulties. He was chosen as a compromise candidate. Visconti was not even aware that he was considered as a candidate; he wasn't there. He was with Edward I of England on the Ninth Crusade as a papal legate. While there, he had been met by the Polos, who had letters from Kublai Khan for the pope. When word came to him that he was the new pope, his first act was to request aid for the Crusade. He then sailed for Italy and called the Second Council of Lyons to discuss the East-West Schism and corruption in the Church. He also heard from the Polos again, who pressed him (now that he was pope) on Khan's request for 100 priests to come east and explain Christianity. The new pope, who took the name Gregory X, could only offer a few Dominicans (who tarted out on the long journey, but lost heart and turned back). Gregory did establish relations with the Mongols, however, when the Mongol ruler Abaqa Khan (12342-1282) sent a delegation to the Council of Lyons to discus military cooperation between the Mongols and Europe for a Crusade. Plans were made, money was raised, and then Gregory died on 10 January 1276. The project failed. Novatianism was one of the philosophies mentioned by Socrates Scholasticus. It was a (literally) less-forgiving brand of Christianity, promoted by a man who deliberately set himself up as one of the first anti-popes. Novation (also called Novatus) was a 3rd century scholar and theologian during a time when Christians were still being actively persecuted in the Roman Empire, especially during the reign of Emperor Decius (249-251). Decius assassinated Pope Fabian (c.200-250), and executed many Christians unless they chose to renounce their faith and worship the Roman pantheon. The position of pope remained vacant for a year. After the death of Decius in 251, a moderate Roman aristocrat named Cornelius was elected by a majority of local bishops. Pope Cornelius was willing to forgive the Lapsi, the lapsed Christians who saved their lives by recanting or worshiping in the Roman style. This was unacceptable to Novatian. He got three bishops together in Rome who were willing to see things his way, and they elected him pope. Both popes sent messengers from Rome to declare their election. Confusion reigned, then investigation. The Church in Africa supported Cornelius, as did (Saint) Dionysius of Alexandria and (Saint) Cyprian. Novatian tried to use his "authority" to create new bishops to replace those in the provinces. It quickly became clear that Corneliuus was favored over Novatian by the majority, making Novatian the second anti-pope. The roots of his unwillingness to forgive such disloyalty to Christianity did not just come from a stern nature, however; he believed forgiveness by the Church was simply not possible. He held that only God had the power of forgiveness for sins, and that earthly prelates could not pardon the serious sin of idolatry. This was not unprecedented: Tertullian (c.160-225) had criticized pardons for adultery made by Pope Calixtus I (217-222). Ultimately, however, the church decided to allow itself to forgive sins. Novatianism survived a couple centuries after his death in 258, but as a heresy, eventually to be stamped out and replaced with a more forgiving Christianity. Novatian may no longer have followers, but he has at least one fan, who offers a picture of Novatian's tomb. When American actress Grace Kelly married Rainer III of the House of Grimaldi, Prince of Monaco, in April of 1956, the world suddenly noticed Monaco. This principality on the Riviera, halfway between Nice and Sanremo, is largely a tourist attraction now, but hundreds of years ago was considered a strategic military location. The quarter called Monaco-Ville was once known as the Rock of Monaco, on which the Castle of Monaco was a hotly contested structure, especially if you were Genoese or an enemy of the Genoese. Which brings us to the Grimaldis. Their founding father was a Genoese statesman named Grimaldo who lived in the 1100s. His sons and grandsons became a maritime force to be reckoned with. Fearing that a rival family might become more powerful and take over Genoa, the Grimaldis entered into an alliance with their fellow Guelphs, the Fieschi family. * Military conflicts between families ensued. In 1271, Guelphs were banned from Genoa, and the Guelphic factions sought refuge elsewhere. The search for strategic locations included setting sights on the Rock of Monaco. The Guelphs made peace with the pope five years later, but several chose not to return but to stay in other locations where they could raise armies against future conflicts. Tides turn, and in time the Ghibellines were exiled from Genoa. As Guelphs and Ghibellines took turns being exiled and needing headquarters elsewhere, the Rock of Monaco changed hands more than once. Then, on the night of 8 January, 1297, François Grimaldi and his cousin, Rainier I, approached the castle of Monaco, which was then in the hands of the rivals of the Grimaldis. But he did not approach in force; instead, the story says, he and his companions were dressed as friars. When the gates were opened to admit the group of friars, however, swords appeared from under their robes, and the surprise attack allowed the Guelphs to take over the castle. The coat of arms of the ruling family of Monaco commemorates this event by depicting two monks with swords. Sadly for François, his marriage produced no heirs. He did not, therefore, establish a dynasty. In fact, the Grimaldis were driven out of Monaco a few years later. They returned, however, and re-took it by force this time. After François died, Rainer I, the cousin who accompanied him on his Trojan Horse raid, became the first sovereign Grimaldi ruler of Monaco and began the dynasty whose descendant made a star into a princess. *The Guelphs were a faction that supported the Pope's interests over those of the Holy Roman Emperor; supporters of the HREmperor were known as Ghibellines. The situation described above changed with Eusebius of Cæsarea (c.263-339), first mentioned about the finding of the True Cross. Eusebius decided to write a history of the Church from its start to his time, earning him the title "Father of Church History." He did such a commendable job that none of his contemporaries bothered duplicating his work. There were, however, attempts to continue it, which brings us to Socrates Scholasticus. Socrates Scholasticus, also called Socrates of Constantinople because he lived there and was very proud of his city, leaves us very little biographical material to go on. His continuation of Eusebius ends in 439, which is presumably the date of his death. We can only guess at his birth, and then only if we make assumptions about whether he was an eye witness to any of the events about which he writes. But we can tell a few things about him. He was very proud of his city, Constantinople, praising it and describing changes to it. Although he holds bishops in high esteem for their position and monks for their piety, he is able to criticize prelates and decisions without hyperbole. Also, as much as he clearly is devout about the Church, he gives details of offshoots without condemnation. Therefore, he writes simply and without hostility about Arianism and the divergent practices of Macedonians, Eunomians, and others who were considered heretics. Socrates' desire to be complete with his history makes him one of the prime sources for updates on a 3rd-century schism first mentioned by Eusebius. In fact, he offers so much detail on Novationism that some scholars think he was a Novationist himself. What was a Novationist? A follower of Novation, one of the first people to deliberately set himself up as an anti-pope. Yesterday's post told of Empress (later Saint) Helena, the mother of the Emperor Constantine, and her finding of the True Cross. According to the historian Socrates Scholasticus (c.380-?? ), when she came to the place on which Christ had been crucified, she objected to the presence of a Temple of Venus on the spot and ordered it destroyed, and even the earth on which it stood removed. The following excavation revealed three crosses and a loose titulus (the slab on which had been written Christ's titles, in Greek, Latin and Hebrew). She gave the Cross to the heads of Jerusalem to preserve. Cyril of Jerusalem (c.313-386) records, in his lectures on the Crucifixion, that a relic of the True Cross can be found in the Basilica of the Holy Sepulchre (completed in 335 CE) as early as the 340s. We learn more about how the Cross is treated from the account of a nun named Egeria; her Itinerario Egeriæ (Itinerary of Egeria) tells how the silver reliquary is brought out and the piece of the Cross is held firmly in the two hands of the bishop; people com forward and bow to kiss he wood while deacons stand guard. The numerous deacon-guards were necessary because someone once bit off a piece of the wood to take away. Fragments of the Cross were distributed among the worthy. Cyril of Jerusalem as able to say "The whole earth is full of the relics of the cross of Christ." Small fragments in gold reliquaries could be worn as protection. A piece was sent to Pope Leo I (c.391-461), one supposedly to King Alfred the Great of England in 883 (recorded in the Anglo-Saxon Chronicle). Fragments were captured in battle and held for ransom, or remained in pagan hands until re-captured. 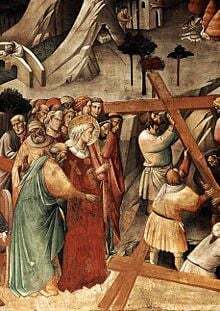 In some places there are large fragments, as at the Holy Chapel in Paris, at Poitiers, and at Rome, where a good-sized crucifix is said to have been made of it. In brief, if all the pieces that could be found were collected together, they would make a big ship-load. Yet the Gospel testifies that a single man was able to carry it. St. Helena also found nails with the Cross. She sent two to her son so that one could be inserted into his helmet and protect him in battle, and one likewise could be inserted into the bridle of his horse for more protection. One (of these?) nails made its way to Theodelinda and thence to the Iron Crown of Lombardy. Debates over the number of nails used at the Crucifixion* (3 or 4?) have gone on for centuries, but are perhaps moot, since besides the Iron Crown o Lombardy, nails from the True Cross can be found in the treasuries of both the Cathedral of Trier and Colle di Val d'Elsa near Siena, built into bridles at both the Cathedral of Carpentras and Milan, in the Holy Lance of German royal regalia in Vienna, and in Santa Croce in Rome. But then, you would need a lot of nails to hold together all that wood mentioned by Calvin. *There is even a special term, triclavianism, for the belief that only three nails were used. Yesterday's post mentioned a nail from Christ's cross that had been possessed by the Emperor Constantine (c.272-337), the first Christian Emperor of the Byzantine Empire. We are told he had been given the nail by his mother, Helena. Flavia Julia Helena (246-330) was born in Drepanum in Asia Minor (re-named "Helenopolis" after her death by Constantine). There is a tradition in England that says she came from Colchester, a town that nowadays has schools named for her and a road named for Constantine, but since Colchester was Rome's capital city in Britain at the time, perhaps this tradition has a more mundane and municipal explanation. * Much has been made of Constantine's conversion to Christianity and his decree that it become the official religion of the Roman Empire, but his mother did something that would help to bring focus on the new religion. How she first came into the Roman picture isn't clear. One story tells that Constantine's father, Constantius, met her in Asia Minor while stationed there on behalf of the Emperor Aurelian. Constantius met a woman wearing a silver bracelet identical to one he was wearing, and took it as a divine sign that they should be together. Some contemporary historians call her Constantius' wife, some his concubine (but those were rivals of Constantius who were trying to de-legitimize Constantine). St. Jerome (c.347-420), with perhaps an attempt at some sort of fairness rather than a historian's lens, refers to her as both. She had a checkered career, taking part in many acts that may have been politically convenient but would not now be considered proper Christian behavior. She also had a reputation, however, for acts of charity to the poor, and for worshiping in humble attire. Her greatest contribution to Christianity came when Constantine gave her unlimited resources to find relics connected with the new religion. She set out for the Holy Land. Eusebius of Cæsarea (c.263-339) credits her with establishing the Church of the Nativity in Bethlehem (commemorating Christ's birthplace), the Church of the Mount of Olives (commemorating Christ's ascension into heaven), and she may have been responsible for a church in Egypt that commemorates the burning bush of Moses. According to legend, she began an excavation...somewhere...and lo and behold, unearthed three crosses. The story of the Crucifixion immediately sprang to mind, but she wanted empirical (pun intended) evidence. With the help of Bishop Macarius, each of the three crosses was brought into contact with a local woman who was deathly ill. Contact with the first two produced no effect, but contact with the third caused the woman's health to return immediately. They realized that they had located the True Cross on which Christ had been crucified. The true era and business of holy relics could now begin...and did it ever! *This is from Geoffrey of Monmouth's Historia Regum Britanniæ [History of the Kings of Britain], and makes Helena the daughter of Coel of Colchester, the "old King Cole" of nursery rhyme fame. The Eastern Emperor Justinian's (482-565 CE) attempt to conquer the Western Empire left it bruised and open to invasion. The Lombard Kingdom was established by Germanic tribes who flowed into the Italian peninsula after its population and political infrastructure was devastated by attacks from Byzantine forces. Between Lombards and Byzantines, Italy was carved into a series of ever-shifting boundaries for the next few centuries. One of the early rulers of the Lombards married a Bavarian princess named Theodelinda (c.570-628). Because of actions she took that helped stamp out Arianism in Italy, she received some notable religious gifts. One of her gifts was a nail, purported to be from the True Cross and originally in the possession of Emperor Constantine (272-337), who received it from his mother, St. Helena (246-330). What does one do with an iron nail that is a relic of Christ? Turn it into an accessory! 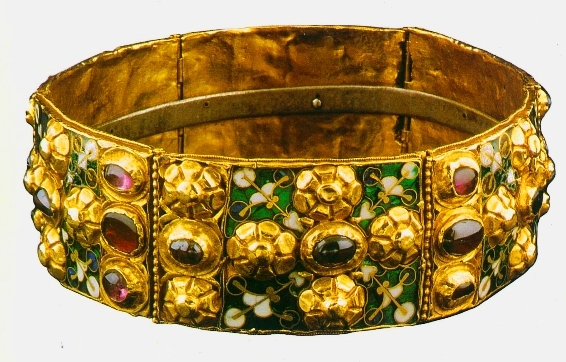 Although we believe the iron nail (the crucial antecedent to the Iron Crown) was brought to the Lombards by Theodelinda in the early 7th century, the Crown itself is believed to have been made in the 8th or early 9th century. DailyMedieval's research has found references to Carolingians taking up the Iron Crown (the "forgotten" King Carloman in 781 and Lothair in 829). Religious authorities argued over the centuries over the validity of the nail. The Crown was alternately declared a "relic" of Christ or a fake. In 1715 the Congregation of Rites in Rome (which supervises the liturgy and sacraments) allowed that the Crown could be displayed in public as an object of veneration without committing to the authenticity of the "nail." The Iron Crown of Lombardy is kept at the Cathedral of Monza outside of Milan. Authorities at the Cathedral point out that, despite the centuries of exposure, the inner iron ring shows no rust. A 1985 examination determined that magnets are not attracted to the "iron" ring. More research is needed. One of the largest cathedrals in England—in fact, one of the longest Gothic cathedrals in Europe—Winchester has been through many changes. The original building (on a site just north of the present cathedral) was founded in 642 and over time came to hold the remains of several Saxon kings. William the Conqueror, wishing to show the strength of his Norman regime after 1066 (or wishing to placate God for any sins William might have committed) began a building campaign, replacing several Saxon churches all over England with great Gothic edifices. He also needed men to guide the dioceses connected to the new structures. For Winchester, that would be his cousin and personal chaplain, Walkelin, who was consecrated bishop in 1070 for the express purpose of running Winchester. This nepotism benefited Walkelin, who was able to "pay it forward": he made his brother Simeon the prior of Winchester, putting him in charge of the monastery that had started in 971. He later helped Simeon become Abbot of Ely. Walkelin also later advanced his nephew Gerard to become Archbishop of York. To build the new cathedral would take materials, and since all natural resources in England belonged to the king, it was up to the king to allocate them as he saw fit. William gave Walkelin access to Hempage Wood in Hampshire, granting him as much wood for timbers and scaffolding as carpenters could produce in four days and nights. Walkelin took no chances: he assembled an army of carpenters sufficient to cut down the entirety of Hempage. The new Winchester was completed in 1093, and a grand and joyous procession of monks carried the relics of saints (especially of St. Swithin, former bishop of Winchester and patron saint of the old church) from the old building to the new. Under William Rufus, Walkelin supposedly refused to send the king a large sum he was requesting, because Walkelin knew he could not raise the sum with taxing (and oppressing) the poor in his diocese. Instead, the bishop prayed to be delivered from the difficulty he was in. Ten days later he died, on 3 January 1098. *Annales de Wintonia [Annals of Winton], entry for 1086.